Rembrandt Rijn was a Dutch artist who is known for painting "The Night Watch." Editorial credit: InnaFelker / Shutterstock.com. 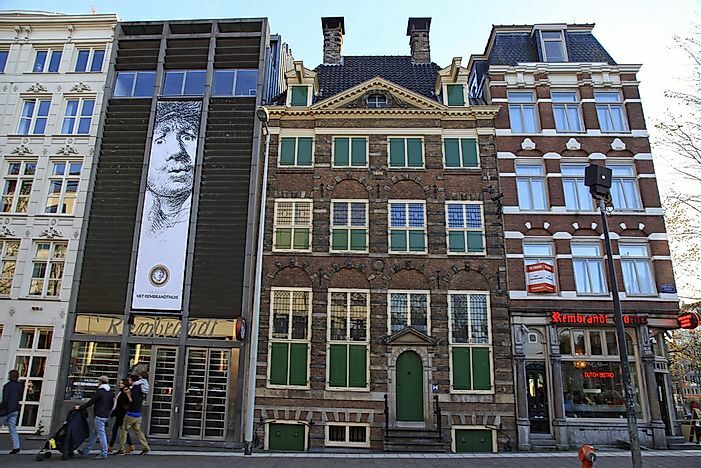 The Rembrandt House Museum is seen here in Amsterdam, the Netherlands. Rembrandt Rijn was a Dutch painter, print maker, and draughtsman famous for his outstanding paintings. Rembrandt was born in 1606 in a family stable enough to send him to Latin school and Leiden University. After his stint with academics, Rembrandt apprenticed under established painters sticking to painting as his career. During this time, he moved between Leiden and Amsterdam. In Amsterdam, Rembrandt met and married Saskia van Uylenburgh with whom he had four children. Out of his four children, only Titus, the third child, survived to adulthood. Rembrandt made paintings of the sick Saskia before her death in 1642. Rembrandt later had an affair with Titus’ nanny and later with the maid Hendrickje Stoffels who bore him a daughter. Towards the end of his life, Rembrandt sank into poverty, probably from his extravagant spending habits and a change of taste in art, which saw a reduction in sales of his works. Rembrandt died a poor man in 1669. Despite his academic background, Rembrandt pursued painting and apprenticed to Jacob van Swanenburgh and Pieter Lastman. Together with his friend Jan Lievens, Rembrandt opened a studio in 1624. After establishing the studio, Rembrandt enrolled interested artists and taught painting for another 20 years. Throughout his career, Rembrandt learned new styles and arts such as portraits, etchings, and drawings. Besides his works, Rembrandt also worked on commissioned works. He grew to become one of the most influential and famous artists of his time. His career declined after he painted The Night Watch, landing him in a series of financial difficulties and bankruptcy. Despite this, he continued painting, most likely with the hope of improving his financial standing. He also continued teaching students. Some of his students include Gerrit Dou, Govert Flinck, Ferdinand Bol and Aert de Gelder. Rembrandt drew his artistic influence from Italian and Holland painters. He displayed his uniqueness as an artist by using various styles of painting and evoking emotions with his art through the use of shadow and light. He painted scenes from different genres and backgrounds including portraits, biblical and historical themes and allegories. Rembrandt was part of the Dutch Golden Age and Baroque artistic movements. Also unique to Rembrandt was his originality and experimentation with various effects which often made his works the subject of criticism. Rembrandt produced hundreds of works including paintings, etchings, and drawings. Some of his famous works include The Night Watch, Belshazzar’s Feast, Bathsheba at Her Bath, and The Jewish Bride. The works of Rembrandt influenced the artists of his time and later centuries. His works are among the most famous art pieces in the world. His works are renowned for their originality, emotion, and depiction of motion and action, unlike the still paintings during the Renaissance period. Critics and other artists have studied most of his works especially his focus and depiction of religious themes, which is interpreted as a reflection of his beliefs. His works are found in several European and western galleries and museums including the National Gallery- London, the Louvre Museum, Rijksmuseum, the Hermitage Museum, and the Metropolitan Museum of Art- New York.